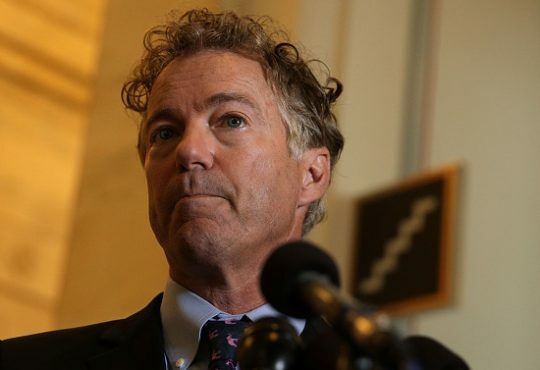 Kentucky Secretary of State Alison Lundergan Grimes (D.) said Friday that Sen. Rand Paul (R.) "can be beaten," "just ask his neighbor." Grimes made the comment at Kentucky's Fancy Farm picnic, which serves as a start to the state's campaign season for both parties, the Associated Press reports. She said at the Democrats' traditional bean supper, "many folks think that Rand Paul can't be beat. I don't buy that. Just ask his neighbor. He can be beaten." Grimes was referring to a November attack on Paul by his neighbor that left him with five rib fractures, including three displaced fractures. After the attack, Paul also bled from cuts around his mouth and had difficulty breathing. As for being beaten in an election, Paul first ran and was first elected to the Senate in 2010. He subsequently won his re-election race in 2016. Doug Stafford, Paul's chief strategist, called Grimes' remarks "almost as sad and pathetic as her last campaign." In 2014, Grimes ran against Senate Majority Leader Mitch McConnell (R., Ky.) for Senate. She lost that race by over 15 points, but won re-election as Kentucky's secretary of state by just over 2 points a year later. Grimes faces criticism from other Republicans in Kentucky, too. Hardin County Republican Party chairwoman Kathy Sargeant said the joke was "low, even for her." In an interview with the Courier Journal on Monday, Grimes dismissed criticism and said, "Everybody needs to go in there with thick skin." This entry was posted in Politics and tagged Alison Lundergan Grimes, Kentucky, Rand Paul. Bookmark the permalink.